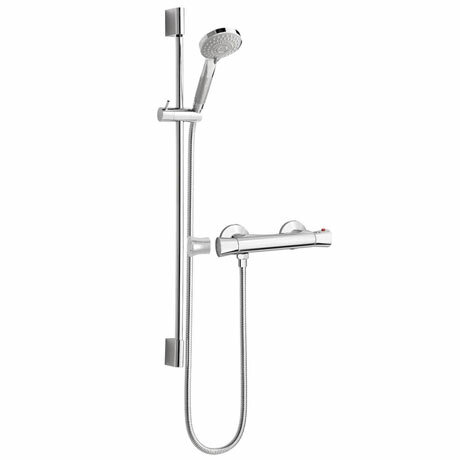 The modern Naples round thermostatic shower bar valve with slider rail kit offers thermostatic showering with two easy to operate controls, one operates flow control whilst the other allows temperature selection. Features an automatic anti-scald device that ensures that showering is safe and convenient. Supplied with decorative shrouds/covers to protect and conceal tile/wall edge, giving the installation a neat finished appearance. The modern slide rail comes with a multifunction handset featuring three spray functions.